Just like what famous food writer James Beard always says, "Food is our common ground, a universal experience.” People would always think of food as the top most essential need of every human body. But behind all the science, the arts and even the culture that surrounds every aspect of food, we tend to leave behind what matters most, how to sustain real, safe and healthy foods not to compromise with the negative effects of eating food that are merely giving every bit of junk in our system and eventually shedding off environmental resources. So when I found out about a group of people driven with particular goals to preserve every ounce of meaningful food habits and are collectively putting up events to promote local, seasonal, and sustainably grown ingredients, I never hesitated but to give them a hand. The Moveable Feast is at it again on their regular farm-to-table concept dining. Spear-headed by Jenny Pascual and a joint effort from artisan food-makers. Moveable Feast aims to bring together slow-food advocates, epicures and anyone who just loves eating and talking about food. One of their thrust is to transcend the message to bring forth transition to a sustainable food future by educating people about the benefits of sustainable agriculture, wholesome food, and by providing resources and access to our farmers, foodmakers, and businesses to help consumers make better food choices. 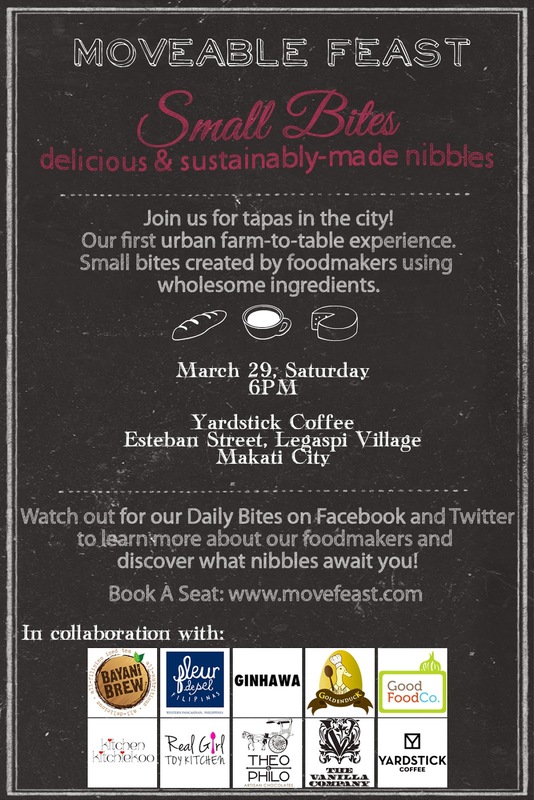 To inquire about how to reserve your slot kindly visit their website at www.movefeast.com. Oh too bad I missed the event. Will they have another one?